Using Bird Feeders for HouseplantsI picked up two inexpensive wooden bird feeders that were actually a little broken in a local department store for $1 each. I decided to use them inside my house to hold some hanging plants. I bring in a number of herbs for the winter and so window and plant space becomes an issue for me in the winter. Hidden Waterfall (White Haven, PA)I've been exploring the area. There is a dam and nature preserve nearby that looked inviting. I followed the road about 3 miles and saw a sign for a boat launch. I made my way down, but was disappointed that the water was low. 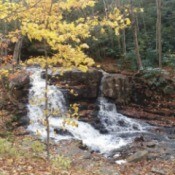 Driving up toward the main road, there was this gorgeous waterfall that I hadn't noticed on my way down! 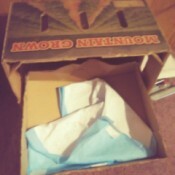 Use Puppy Pads in Litter BoxI like to use a puppy pad in our litter box. This is for one older kitten. I'm sure it would work better for multiple cats. The kitten also uses the puppy pad meant for the Chihuahua puppy. I wondered if I could teach the kitten to use the puppy pad and I am so glad she did! 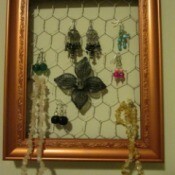 My Framed Jewelry Display HolderI have lots of frames left from wall hangings in the past. Some of them with beautiful art details were very hard to part with. So I thought of making a creative and very functional piece which also becomes art. Pumpkin Pie GarlandWhen decorating for different holidays, I love to see festive garlands. 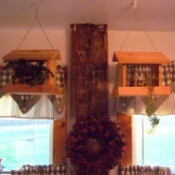 And since pies are a very popular dessert for Thanksgiving, it makes sense to incorporate them into the decor somehow. 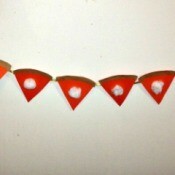 I chose to make a garland out of paper pumpkin, apple, and cherry pie slices. 14h Birthday Party IdeasMy daughter wants a party for her 14th birthday, although she doesn't think parties are accepted socially at her school. She thinks all the party ideas she has will be lame and everyone will laugh and make fun of her and not want to come. What do I do for ideas to make a party for her that is not lame? Identifying a Porcelain DollI have a porcelain doll I think. It is fully jointed with this hallmark. Making Christmas Tree Ornaments from Used CardsHow many Christmas cards does it take to make a medium size Christmas tree ornament? Volunteering to Feed the Homeless on ChristmasI would like to know if there are any places in Columbus, Ohio that are serving the homeless on Christmas Day? Value of a Wurlitzer JukeboxI am trying to determine the value of a 1970s Wurlitzer Fuego jukebox. 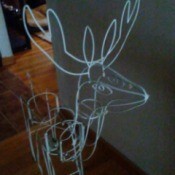 Replacing the Lights on Outdoor Christmas DecorationsI have 3D reindeer from the 80s. The lights were a mess so I cut them off and need to replace them. 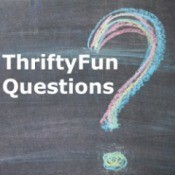 What are the best and easiest lights to use? I have a lot of deer and a large village. Finding Assistance After a House FireWe had a house fire and no insurance. The Red Cross gave us 900 dollars and most of that went to motel rooms. We have nobody. 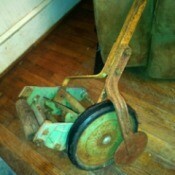 Value of a Mast Foos Co.Vintage Lawn Mower and EdgerHow much money is my Mast Foos Co. lawn mower/edger worth? I think it may be worth a pretty penny. All I can find out is that Mast Foos products are in museums! Value of an Ashton Drake Galleries DollI was gifted a Ashton Drake Galleries doll. 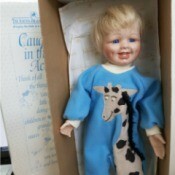 Could you please tell me the doll's value. 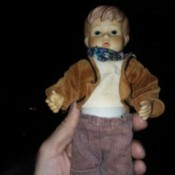 The doll is the first issue in the "Caught in the Act" Collection from the "Catch Me If You Can!" Value of Collier's National EncyclopediaI have a set of 10 volumes plus the index of Colliers National encyclopedia, copyright date 1932, 1933, 1934. What are they worth? Zebra Finch Nest and Eggs Knocked DownWe have a pair of zebra finches. They built a nest and laid 2 eggs which surprised us because we got them from someone that told us they where just a few months old. Never the less things where going great, the dad was brining twigs to make a roof and they where taking turns nesting on the eggs. Hair Is Green in Spots After ChemoMy hair is turning green in spots why? I have had radiation and chemo in the past and lost all my hair. It came back gray (was a dishwater blonde). I have had it cut short, but it still comes back green?